posts and all the other ones too. While you people talk about flooded deck theory keep in mind there is a gate cut out from I-Beam where cherrypicker is parked probably for it to drive out from (visible on photos by Stephen Clark). Two tower antennas about ~30ft in height in Eer's photos are not there in Stephen Clark's photos or cbsnews photos, towers are in Fascination images old as well as new. Elsbeth III got a deluge gun as well so plenty of fire suppression I guess. I'm the only one to see rows of holes on the deck? Look left of the red lines. Yes, I do wonder why we don't see them also in other pictures. Especially those from directly above provided by SpaceX. Another point. Yes the puddles of water indicate strongly that there is no grid. However some argued the difference in texture is due to the central part is the original deck only painted over. Is that really likely? It seems to me they would have built the whole deck surface to their needs and it would not be the original deck. Would the original barge deck that flat without any surface structures? EDIT: Oh I forgot to add even a slight elevation in 'wings' can make them look different due to different brightness and it would also make them dry faster than main body. And you can't see those holes from top as they are cut out from lower flange of I-beam. Also those prongs visible on each container are probably ladders...they look unsafe . "Well, three cheers to Sharma, but our real baby is INSAT." Ohsin, cambrianera was talking about the holes in the deck in that picture. Not the scuppers cut into the I-beam around the edge. If you look along the left of the red lines, you will what he was trying to highlight. Again, not at the end of the lines but along the side of them. You really need to enlarge the picture to see them very well though. I think it's likely just coincidence that the lines also nearly point at the scuppers. From the side, they look just like standard tie-down holes. Regarding the steel deck, I'll guess it's just stock with a good flight-deck type non-skid. As for the red and green "people" on the gangplank, I think those are life-jackets hanging there. They show up in other close-ups. I find this photo collage fantastic. Enlarged on my phone I can fuse it perfectly. It is like being just onshore from the barge. Gives a real sense of scale and structure. It's not too likely they're going to land a rocket on the thin steel of the main deck unless they're trying to sink the barge. That deck is a main structural component and you really don't want to weaken parts of it by heating it with an M1D. Do we know what the deck plate thickness really is? I saw one used "heavy duty" barge for sale with a deck thickness listed as 1". The Marmac 300 has some specs listed online but I wasn't able to find a deck thickness spec. FWIW, the site below calls Marmac 300 a "heavy deck" barge. And this paper from some MIT students seems to suggest a nominal thickness of 20 mm for a Marmac-400-class barge. So it seems possible that the Marmac 300 "heavy deck" barge could have a deck plate thickness around 3/4" or so. Wow, at 20 mm, 100mx60m, that's 10^6 kg of steel. And (IMHO) a steel deck 20 mm thick doesn't need cooling to avoid deformation, only a plus to minimize surface damage. "Ballast Water Capacity: 4105360 gallons"
"Vessel Dimensions: Weight: 4422 gross tons"
So that's about 35 Mlb of water ballast vs. about 10 Mlb of barge weight. A rough estimation on location of those 'tie-downs'/holes on barge. Red lines are very roughly along the view of camera on IMG_2178 and tie downs align to these diagonally. Blue lines run along the width of barge. Red dots are visible tie-downs and Green dots are other positions on grid. Notice the grid is skewed about ~3.5 degrees and doesn't fit but its quite close I think. I see them too - but only since you pointed them out. Good eyes, sir. I'm embarrassed to admit this, but when I posted my initial speculation regarding the deck being built to retain something (water, foam, whatever) I mentioned that scuppers could be very small, just holes cut in the I mean every few feet. I looked for just that, and didn't see them. Well, hrmmm, to avoid having to admit I was wrong (which, of course, I was) I'll adjust my holding-water theory slightly, and say that I think the ASDS, while not having a layer of water atop the deck, will still need to have one below it. A very, very large one. In fact, I'll go so far as to say that it'd be nearly useless without it. EDIT: Cruise ship did a right turn today while leaving, revealing area around barge. I have a bit of a hypothisis on the yellow I beam rails along the long edges of the deck. Not that I'm strongly convinced that this is the case but there is the possibility so I throw it out for your consideration. The thought was kicked off by the yellow color of the rails and the yellow color of overhead bridge cranes that you see in industrial warehouses. Could they be tracks for a mobile rocket handling / securing / horizontalizing device to be added in the future if the first few landings go well? SpaceX already uses overhead cranes in their facilities of course. And tracked bridge cranes are used for handling hatch covers on ships (that I know of, possibly more). Some of the images we've seen appear to show the yellow rails as being not straight but from the cruise ship angle you can see that they are very straight. Thoughts? I like the thinking, but I don't think so. Why have 90 deg. turns at the ends? And I don't think it is offset enough from the railing/fencing. If they wanted to use them as rails for something, I would have expected them to be a little inboard. That way, whatever is riding on the rails can get all the way around the I-beam. Looks like SpX has built a mini F9 pad next to the ASDS dock and SpX trailer. The 4 grey structures seem to be similar to the hold downs / supports used for the F9 VTVL tests. My guess: Upon return of the stage it will be lifted (extended legs and all) onto the VTVL stand. Legs will be re-stowed then and the stage made ready for return to either McGregor or Hawthorne via road-transport. With this structure being mounted on a cast-concrete foundation I would guess SpaceX expects more than one stage to be handled by this structure. It's definitely a (semi) permanent structure. Can see Elon standing in front of the F9 & answering a few press questions. 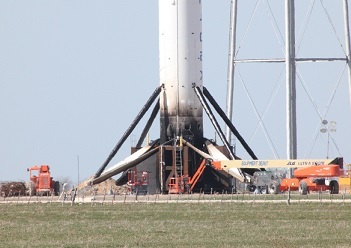 BTW good call on the landing leg fold up as when the F9 is mounted on the launch supports, the end of the landing legs are clearly well off the ground. What's the consensus on when the ASDS barge will leave port to support the Jan 6th launch? I figure two to three days to transit and then get everything set up and running, so maybe 3 Jan? Here are all the interesting frames from the right turn of the cruise ship. Seems that SpaceX has fenced off that part of the port and has some heavy equipment parked around. They surely have enough space to handle the first stage, and it looks that there is probably enough for 2 or 3 first stages with the accompanying barges if they decide so. We can also see the bridge where most of the pics of the ASDS were taken. Are there any public records about SpaceX leasing/renting that part of the port? The start date and especially the duration of the lease will be very interesting. I have found that this structure and the SpaceX container do not exist on the aerial image SpaceX published on 2014-12-16. Mostly agree but probably legs will be disassembled then stage lowered for road transport.